We tried something different, and…it was a success! 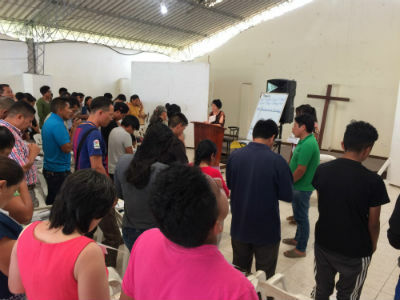 Each year, the Church of God seminary in Ecuador offers a week long intensive to help train leaders in the Ecuadorian church. This year, we expanded the reach of the seminary by offering more class options, moving to a more spacious location, and including more Ecuadorian leadership. Last year, we had a total of twenty-five participants, with one international student. This year, we had seventy-six participants, with several international students! Last year, we offered five classes for the edification of the students. This year, we were able to offer ten classes and a writing seminar. 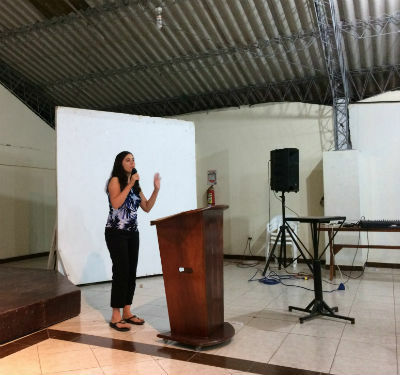 Last year, two pastors besides the missionary, and outside the Church of God, taught classes. This year, seven classes were taught by our Ecuadorian pastors, three were taught by visiting professors, and the writing seminar was taught by the missionary! Last year, we held classes at the seminary building in Quito (we are blessed to have such a wonderful building, but it could not have housed all our students this year). We were able to hold classes at a campground that could have facilitated double the number of students! Last year, the student surveys evaluated the classes as “valuable, but somewhat lacking.” This year, the surveys and comments were overwhelmingly positive. 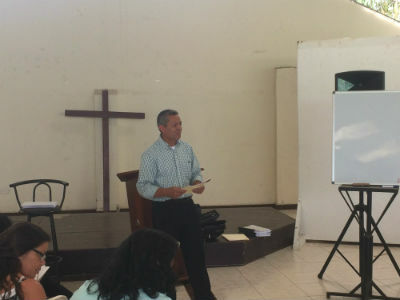 Pastor Jorge Palacios (Pennsylvania) was a guest teacher. Perhaps the best indicator that this year was a success is the feedback we have already received about the students from their pastors. This year, the students returned to their churches, excited and willing to employ their newly acquired knowledge in their churches. Of course, all the many successes of this year were built on the firm foundation of years past. For many years, missionaries like Jon and Karen Lambert, Gregory and Linda Robertson, Jonny and Paula Snyder, Karvin and Sandy Adams, and Narciso and Udelia Zamora developed the seminary program. In addition to so many dedicated missionaries, countless visiting professors have poured their time, talent, and treasure into developing our seminary program. It is on the shoulders of so many great leaders that we were able to achieve such a wonderful success this year. If you donated this year to the seminary project, you were a major part of our success. By faith, we planned something bigger than we have ever attempted before, trusting that God would provide the funds through his faithful church. Your gifts, added to the sacrificial giving of the Ecuadorian church, is what funded this vital ministry! We already have a team working on the next two year’s seminary intensive weeks, and we have already received some much-needed prayer and financial support. Will you join us? We need your prayers and your donations to ensure the future success of the seminary program. We have big plans for the future, but we can only reach them with your help. To donate to the Ecuador Seminary Program Funds Project (42.40192), please click here. Regional consultant and missionary Abby Torgeson teaches. Since we are already asking for your support, could we ask for your help in one more important way? We need you to lend us your voice! Will you please take some time and share this success story with your pastor and missions committee? Will you please advocate for your church to get involved in this Great Commission ministry? We need you, your prayers, your donations, and your voice. Together we can make a significant difference in the lives of our Ecuadorian brothers and sisters! Donate online to the Ecuador Seminary Program Funds Project, 42.40192. Or, mail your donation to Church of God Ministries, PO Box 2420, Anderson, IN 46018. Be certain to write Project 42.40192 in the memo line to assign your gift accordingly. Thank you. Learn more about the ministry of Timothy and Angelita Downing at https://www.chogglobal.org/team/tadowning/. Discover the latest updates at their blog, www.ourmissionpath.com. This entry was posted in All Church of God, Global Strategy, Leadership Development and tagged Abby Torgeson, classes, continuing education, courses, Downings, Ecuador, education, Global Strategy, growth, intensive, Jorge Palacios, Latin America, leadership development, ministerial candidates, miracles, missions, Seminary, students, teaching, Tim Downing, Timothy and Angelita Downing, training. Bookmark the permalink.